Who is the Best Louisville Football team in history? Cardinal Pigskin has evolved a great deal since it’s inaugural season in 1912 and has rapidly evolved since opening Papa John’s Cardinal Stadium for the 1998 season (151-75 W-L, 66.81%). When eliminating the “Kragthorpe Affected” years (categorized as 2007-2011) Louisville is 122-42 for a 74.39% winning percentage since PJCS opened. That’s a significant improvement over Louisville’s lifetime 52.34% winning percentage. Still, the Cards have had some really standout teams over the course of its history. Which one was the best? How would we go about determining which team would be the best? Record? AP Rank? Average Margin? Bowl? Achievements & Best Wins? The Cards beat a slate of local teams: Evansville, WKU, Hanover, KY Wesleyan, Transylvania, Rose Poly (Rose-Hulman Institute of Technology in Terre Haute, IN), Toledo, and Marshall. UofL had an incredible defensive performance in 1925 and allowed just 2 points the entire season outscoring opponents 133 to 2. The Cards also had an average margin of victory of 16.375. The 1925 team did not appear in a bowl as the Rose Bowl was the only bowl in existence at the time. 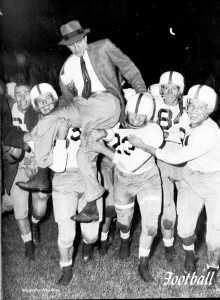 Frank Camp’s 1947 squad finished 7-0-1 and did not finish in the Top 20 (AP Poll went to 20 in 1947). No players off this team went on to play professional football. Frank Camp’s second season at UofL finished without a single loss, yet the Cards did tie a road contest against Saint Joesph’s (IN). The Cards did beat Wittenberg, DePauw, Evansville, WKU, EKU, Southeast Louisiana, and Washington (MO). The Cards had a terrific offense in ’47 and outscored the competition 193 to 63 for an average margin of 16.25. The 1947 team did not appear in a bowl, though 13 bowl games existed for the 1947 bowl season. The 1957 Cardinals were three years removed from the Johnny Unitas era and finished , 9-1. The Cards did not finish in the AP Top 20, but did manage to earn their first bowl bid in school history. Louisville took down Drake in the 1958 Sun Bowl 34-20, and were led by the Louisville Legend Lenny Lyles. Lyles was the only (1) NFL player on the 1957 team, and was drafted in the 1958 NFL Draft in the 1st round, 11th overall by the Baltimore Colts. Lyles of course, was Louisville’s 1st ever scholarship athlete to break the color barrier at the University of Louisville. Mr. Lyles is currently the 3rd leading rusher in school history, 6th in All Purpose Yardage, 1st in rushing TDs, and saw his Career Scoring mark broken by Art Carmody during his record-breaking 2004-07 career. Frank Camp’s 1957 Louisville team was able to beat Evansville, EKU, Toledo, Murray State, Dayton, Central Michigan, Ohio, Morehead State and Drake, but suffered a tough 13-7 loss to Kent State. The Cards outscored their competition 350 to 106 and had an average margin of victory of 24.4! The Lee Corso era of Cardinal Football was highlighted in 1972 with the Cardinals winning the Missouri Valley Conference and going 9-1. The Cards earned their first ever Final AP Ranking at the end of 1972 checking in at #18. 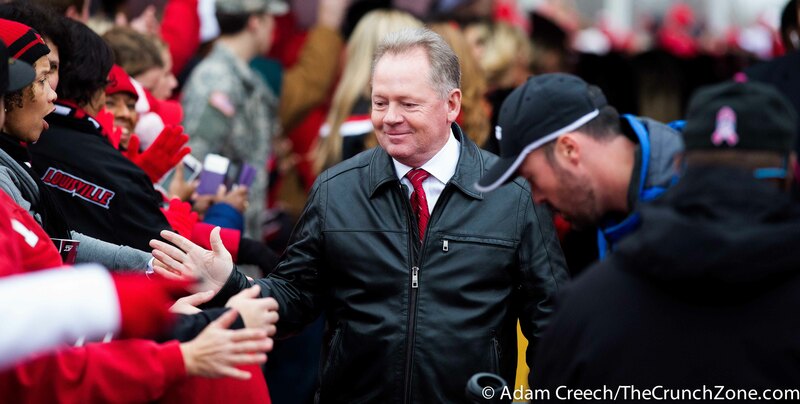 Louisville was not granted a bowl berth despite their sterling record and conference championship. At the time, just 11 bowls existed for a maximum of 22 teams but the Cards were shut out of the postseason. The ’72 squad had 3 future NFLers in Howard Stevens, Tom Jackson, and Steve Reese. Tom Jackson is now famous for his time as an NFL analyst for ESPN, but is also an original member of the Denver Broncos’ Orange Crush Defense and was the 14th player in franchise history to be inducted into the Broncos’ Ring of Fame. Jackson was drafted in the 4th round with the 88th overall pick in the 1973 NFL Draft, was a 3-time Pro Bowler and appeared in 2 Super Bowls. 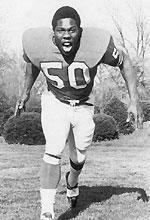 Jackson was the Missouri Valley Defensive MVP in 1972 and is the 9th All-Time Career Tackler at UofL. Howard Stevens played just two seasons at Louisville but made a HUGE impact and currently still holds several accolades including: #1 Single Season Rushing, #1 All-Purpose Yards in Season, 4th All-Time Career Rushing, 6th All-Time Career Rushing Touchdowns, 10th in Career Points, 9th in Career Punt Return Yardage and was the Missouri Valley Offensive MVP in 1971 & 1972. Stevens was the 392nd pick in the 16th round by the New Orleans Saints in the 1973 NFL Draft. Stevens played 5 seasons in the NFL at 5’5″ and 165 lbs, two years with the New Orleans Saints & three seasons with the Baltimore Colts and finished with career with 4391 Career All-Purpose Yards. Steve Reese began his career in the NFL in 1974 (undrafted) and would play 3 seasons at linebacker. The Cards beat Kent State, Dayton, Tampa, North Texas State, Wichita State, Cincinnati, Southern Illinois, Memphis State, and Drake in 1972, and suffered a lone loss to Tulsa 28-26. Louisville outscored the competition 309 to 91 with an average margin of victory of 21.8. Many people credit the Howard Schellenberger era as the beginning of the modern era of Cardinal Football. The Pipe famously is quoted: “Louisville is On A Collision Course With the National Championship, the Only Variable is Time.” A that quote never resonated more during Schnellenberger’s tenure than it did during the 1990 season. The ’90 Cards completed their season 10-1-1, ranked #14 in the Final AP Poll (2nd finish ever in the AP) after dismantling the Alabama Crimson Tide in the Fiesta Bowl 34-7. 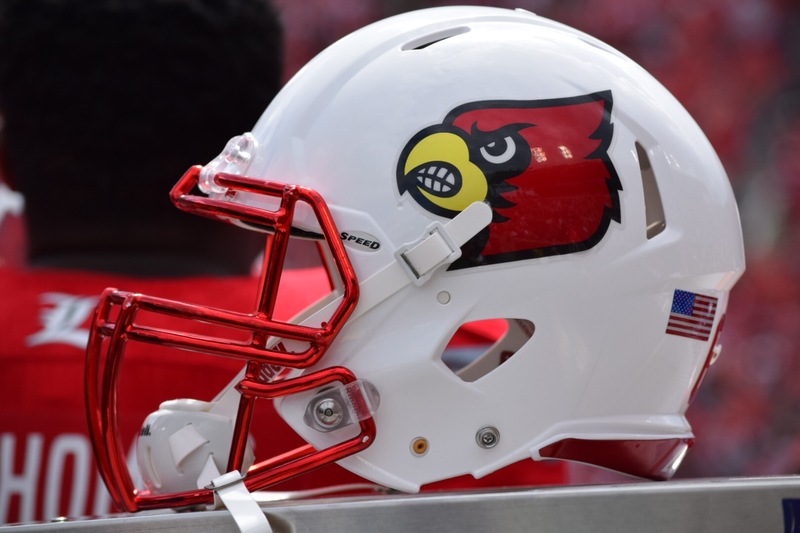 In 1990 the Louisville Cardinals were LOADED with NFL Talent (12), the following players from the roster played in the NFL: Joey Smith, Mike Flores, Browning Nagle, Ted Washington, Mark Sander, Klaus Wilmsmeyer, Jerry Crafts, Ray Buchanan, Jim Hanna, Jeff Brohm, and John Bock. Other notable players who never made an NFL team were also on the ’90 team like Anthony Cummings & Ralph Dawkins. This group to this day still litters the record book at the University of Louisville and includes: 2nd Career Tackles (Sander), 3rd Career Interceptions (Buchanan), 4th All-Time Sack Leader (Flores), 9th All-time Sacks (Washington), 8th Career Passing Efficiency (Jeff Brohm), 10th All-Time Career Passing Yardage (Nagle), 4th in Career Receiving Touchdowns (Cummings), 3rd Career Carries (Dawkins), 10th All-Time Punt Return Yardage (J. Smith), Fiesta Bowl Total Offense Record (Nagle), 11th Career Tackles For Loss (Washington), Longest Field Goal (Wilmsmeyer), and 6th Career Punting Average (Wilmsmeyer). In 1990 the Cards took down Murray State, Kansas, West Virginia, Tulsa, Memphis State, Pittsburgh, WKU, Cincinnati, Boston College, and #25 Alabama. The Cards were stalled in their opening game TIE out west at San Jose State 10-10, and then lost in Hattiesburgh against their traditional rival Southern Miss 25-13. Louisville outscored opponents 345-149 with an average margin of 17.17. The 2001 Cardinals were also full of NFL (10) talent: Deion Branch (Super Bowl MVP XXXIX, Two-time Super Bowl Champion), Dave Ragone, Ronnie Ghent, Anthony Floyd, Curry Burns. Dewayne White, Michael Josiah, Michael Brown, Jason Hilliard, and Richard Owens. John L. Smith’s best team is the 3rd team in school history to finish in the Final AP Poll when the ’01 squad finished #17. In 2001, the Cards finished 11-2, the Conference USA Champions, and also with a 28-10 win over #19 BYU in the Liberty Bowl. The bowl win was the first in 4 tries, and the first bowl victory since 1993’s Liberty Bowl win. Current Records by this group include: 4th All-Time Career Passing Yardage (Ragone), 2nd Most Career Passing TDs (Ragone), 8th Most Career Receiving Yards (Branch), 11th Most Career Receptions (Branch), 6th Most Receiving Yards in a Game (Branch), 6th Most Career Receiving Touchdowns (Branch), 1st Career Interceptions (Floyd) & 2nd Season Interceptions (Floyd), 10th Career Tackles (Burns), 1st Tackles for Loss in Season & Career (White), 1st All-Time Sacks (White), 3rd Season Sacks (White), 3rd Career Sacks (Josiah), 2nd Career Tackles for Loss (Josiah), 1st Career Personal Fouls (Josiah), and 7th Longest Interception Return (Brown). In 2001 the Cards beat New Mexico State, Kentucky, Western Carolina, Memphis, Colorado State, Southern Miss, Cincinnati, Tulane, Houston, East Carolina, and #19 BYU. The Cards did drop a game to Illinois 34-10 (unranked at time of game) but the Illini did finish #12 in the final AP Poll. UofL also lost their regular season finale at TCU 37-22. Louisville outscored opponents 394-223 for an average margin of 13.15. 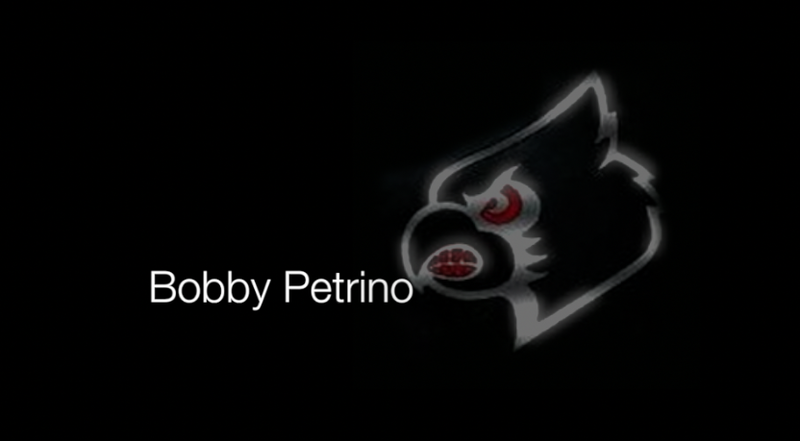 The initial Bobby Petrino era was in full swing in 2004 as the Cardinals finished #6 in the Final AP Poll as the C-USA Champions with an 11-1 record and a thrilling 44-40 victory over #10 Boise State in the 2004 Liberty Bowl (probably one of the most underrated bowl games in history). The appearance in the Final AP Poll was just the 5th team in school history to make the final poll of the season. Additionally this group had the Top Offense in the nation scoring the most points and gaining the most yards per game. Let’s review the 2004 NFL Talent (20): Elvis Dumervil, Kerry Rhodes, Montavious Stanley, Brandon Johnson, Antoine Harris, Robert McCune, William Gay, Amobi Okoye, Stefan LeFors, Brian Brohm, Eric Shelton, Lionel Gates, Michael Bush, Kolby Smith, Gary Barnidge, Harry Douglas, JR Russell, Jason Spitz, Renardo Foster, and Breno Giacomini, And don’t forget Art Carmody who we’re all still wondering why he didn’t get a shot in the league. Currently the following records are held by this group: 1st Sacks in Game & Season (Dumervil), 2nd Sacks in Career (Dumervil), 1st Tackles for Loss in Season (Dumervil), 3rd Career Tackles for Loss (Dumervil), 2nd Career Passing Yards (Brohm), 6th Career Passing Yards (Lefors), 4th Career Passing TDs (Brohm), 6th Career Passing TDs (Lefors), 5th Career Pass Breakups (Gay), 10th Career Pass Breakups (Harris), Youngest Player Ever Drafted in NFL (Okoye), 6th Career Rushing Yardage (Bush), 2nd Career Rushing TDs (Bush), 3rd Career Rushing TDs (Shelton), 10th Career Rushing TDs (Gates), 1st Rushing TDs in Season (Bush), 2nd Rushing TDs in Season (Shelton), 1st Rushing TDs in Game (Shelton), 1st & 6th Season Receiving Yardage (Douglas), 2nd & 10th Receiving Yardage in a Season (Russell), 2nd Career Receiving Yardage (Douglas), 5th Career Receiving Yardage (Russell), 3rd Career Receptions (Russell), 6th Career Receptions (Douglas), 5th Career TD Receptions (Russell), 7th Career Receiving TDs (Barnidge), 9th Career Receiving TDs (Douglas,) 2rd & 10th Receiving Yards in a Season (Russell), 3rd & 4th Receptions in a Season (Russell) 6th & 8th Receptions in a Season (Douglas), 1st & 4th Receiving Yards in a Game (Douglas), #2 Career Made Field Goals, and #1 Career Scoring (Carmody). The 2004 group nearly went unbeaten if not for several unfortunate events in the original Orange Bowl against the #3 Miami Hurricanes, as the “U” made an incredible 2nd half comeback to steal the game from the Cards 41-38. UofL did beat Kentucky, Army, North Carolina, East Carolina, South Florida, Memphis, TCU, Houston, Cincinnati, Tulane, and #10 Boise State. Louisville outscored opponents 597-236 with an average margin of 30.08! NFL Talent (18) on the 2006 does have some overlap from the 2004 team and is as follows: Brian Brohm, Michael Bush, Kolby Smith, Brock Bolen, Anthony Allen, Harry Douglas, Pat Carter, Gary Barnidge, Trent Guy, Eric Wood, Renardo Foster, Breno Giacomini, George Bussey, Kurt Quarterman, Nate Harris, William Gay, Amobi Okoye, and Earl Heyman. Also Mario Urruita and Art Carmody made impact on the record books, and the accolades in the UofL Record books are as follows from this group: 2nd Career Passing Yards (Brohm), 4th Career Passing Touchdowns (Brohm), 6th Career Rushing (Bush), 2nd Career Rushing TDs (Bush), 10th Career Rushing Touchdowns (Allen), 1st Rushing Yardage in Game (Allen), 6th Career Receptions (Douglas), 2nd Career Receiving Yards (Douglas), 7th Career Receiving Yards (Urruita), 7th Career Receiving TD (Barnidge), 9th Career Receiving TDs (Douglas), 8th Career Receiving TDs (Urruita), 5th Career Pass Breakups (Gay), Youngest Player Ever Drafted in NFL (Okoye), 1st Career Scoring (Carmody). Like the 2004 season, the 2006 group almost finished unbeaten before they allowed a HUGE 2nd half comeback by the Ray Rice led #15 Rutgers Scarlet Knights to win on a Jeremy Ito field goal with 13 seconds remaining 28-25. The Cards did beat Kentucky, Temple, #17 Miami (FL), Kansas State, Middle Tennessee, Cincinnati, Syracuse, #3 West Virginia, USF, Pittsburgh, UConn, and #15 Wake Forest. UofL outscored its opponents 491 to 212 with an average margin of 21.46. The pinnacle of the Charlie Strong era happened at the end of the 2012 season in the 2013 Sugar Bowl against the #4 Coaches/AP (#3 BCS) ranked Florida Gators at the New Orleans Superdome. Louisville dismantled the Gators 33-23 with a final score that really doesn’t tell the story of the overall game to finish 11-2 on the season. The Cards shared the Big East Championship 4-ways and took the league’s BCS bid by virtue of having the highest ranking (#21) at the end of a 10-2 season. After beating Florida, Louisville finished the 2012 season with the #13 ranking, just the 8th team in school history to finish in the AP Top 25. The NFL talent (5 of which were 1st round picks) on this team is still taking shape and the 2012 team was an extremely young roster but is so far as follows: Alex Kupper, Jeremy Wright, Marcus Smith, Preston Brown, Calvin Pryor, Teddy Bridgewater, Damian Copeland, Roy Philon, Brandon Dunn, Charles Gaines, DeVante Parker, Eli Rogers, John Miller, Jamon Brown, Gerald Christian, Deiontrez Mount, BJ Dubose, Sheldon Rankins, Lorenzo Mauldin and Senorise Perry have made appearances and/or spent a year with an NFL organization. We are also watching to see if Ryan Mack, Aaron Epps, Jermaine Reve, Keith Brown, James Burgess, Nick Dawson-Brents, and/or John Wallace make NFL teams this summer that made significant impacts on this team. So the NFL measurement of this is still taking shape. But we are only counting NFL players who actually dress in an NFL game and right now the 2012 squad has 20 and could add a few more in the next few years. The record book was greatly affected by the players on this team: Most Games Played (52) and Most Games Started (51) in a Career (Hakeem Smith), #1 Total Offense, Most Yards Gained in a Season (Bridgewater), Highest Completion % in a Career (Bridgewater), Highest Completion % in a Game (Bridgewater), Most TD Receptions in Season (Parker), 5th Most Rushing TDs in a Game (Perry), 10th Most Receiving Yards in a Season & 4th Most Receiving Yards in Career (Parker), 1st & 3rd Most Receiving TDs in a Season (Parker), 1st Receiving TDs in a Career (Parker), 3rd & 4th Most Passing Yardage in a Season (Bridgewater), 3rd Most Passing Yardage in a Career (Bridgewater), 1st & 5th Most TD Passes in a Season (Bridgewater), 3rd Most TD Passes in a Career (Bridgewater), 4th & 5th Most Completions in a Season (Bridgewater), 2nd Most Career Completions (Bridgewater), 2nd, 4th, & 8th Best Completion % in Season (Bridgewater), 5th Lowest INT % Season in Career (Bridgewater), 1st Total Offense in Season (Bridgewater) & 3rd in Career (Bridgewater), 8th Season Scoring (Wallace), 2nd Career Scoring (Wallace), 2nd, 3rd, 4th & 5th Most FGs Made in a Season (Wallace), 1st FGs Made in Career (Wallace), 6th Most TFLs in a Season (Marcus Smith), 6th Most TFLs in a Career (Marcus Smith), 7th Most TFL in Career (Rankins), 8th Most TFL in Career (Mauldin), 4th Most Sacks in a Season (Marcus Smith), 7th Career Most Sacks (Marcus Smith), 9th Career Most Sacks (Mauldin), 7th Most Pass Break-Ups in a Season (Bushell). It is important to note that Louisville lost 2 games in a row during 2012. A 45-26 stunner in Syracuse in the Carrier Dome was the 1st loss after a 9-0 start. A week later the Cards lost to Connecticut 23-20 in Triple Overtime. Louisville did beat #4 Florida during the season, the only ranked win on the season. But the Cardinals did also notch wins over Kentucky, North Carolina, Pittsburgh, USF, and Cincinnati. Louisville outscored its opponents 405-309 for an average margin of victory of 7.38. The final year of the Charlie Strong era inherited nearly the exact same team from 2012 minus a few key elements. The Cards finished #15 in the AP Poll after a 12-1 season and a win over Miami in the 2013 Russell Athletic Bowl at the Orlando Citrus Bowl. 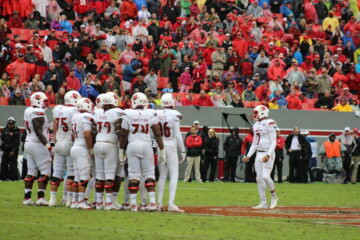 The Cards let a 28-7 3rd quarter lead slip away against Central Florida for the only loss of the season. The NFL Talent on this team (5 of which were 1st round picks) is much of the same of the 2012 team: Marcus Smith, DeVante Parker, John Miller, Jamon Brown, Eli Rogers, Charles Gaines, Preston Brown, Calvin Pryor, Deiontrez Mount, Teddy Bridgewater, BJ Dubose, Sheldon Rankins, Lorenzo Mauldin, Damian Copeland, Roy Philon, Gerald Christian, Brandon Dunn, and Senorise Perry. We’ll be watching to see if Ryan Mack, Jermaine Reve, Aaron Epps, Keith Brown, James Burgess, John Wallace & Nick Dawson-Brents appear in any NFL games this season, as well as several players still on UofL’s roster in 2016 like Keith Kelsey, DeAngelo Brown & Co who will most certainly play in the league. While going 12-1 the Cards took down Ohio, Kentucky, Temple, Rutgers, USF, UCONN, Houston, Cincinnati and of course Miami. The Cards outscored opponents 457-158 for an average of 23.00 points per game. Certainly a case could be made for any one of these teams, but clearly the University of Louisville football program has never been more relevant than since the turn of the millennium with 7 of 15 Finishes in the Final AP Poll and only three prior to that.There is room for debate, however, and we’d love to hear your opinion. For example, the 2006 team beat 3 ranked teams while the 2004 team beat just one ranked team. Also it could be argued that the 2006 Big East Championship team played a tougher schedule than the 2004 C-USA Championship team, thus skewing the stats and the accomplishments in the 2004 team’s favor. We also thought of including the 2005 Gator Bowl team, that really was an outstanding team, but lost their bowl, allowed a huge comeback to WVU, and was blown out by USF. These are all great teams, and we welcome that debate, but it may be hard to argue against the 2004 University of Louisville Football team with its 30.08 average margin. Which Cardinal Squad do you believe is the best in school history?